Our charitable non-profit’s latest financial award was bestowed upon the Greyhound Adoption of Greater Cincinnati, which is dedicated to saving the lives of retired racing Greyhounds. Greyhound racing takes place in 46 tracks in 15 states in America, much to the dismay of many people who find the practice unacceptable. Unfortunately, the life of a racing dog is often a hard one during their years on the track. And the dogs who experience injury on the track, or are not fast enough to consistently place well in races, quickly lose status as prized assets and become liabilities that must be eliminated. Fortunately, not everyone feels that Greyhounds should be treated this way. These exquisite creatures are known for grace, agility, speed and an enormous capacity for caring, making them wonderful companions. Generally, these sleek and muscular canines are great with kids, and rescued Greyhounds are known to bond very quickly with their adoptive families. Currently fostered in a home in Cincinnati, gorgeous Gus sports a brindle coat and weighs in at 70 pounds. This five-year-old is friendly toward cats, very laid back and loves being petted. 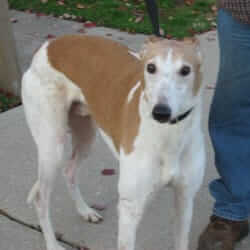 Tall, tan and handsome, he’s certain to be a wonderful first greyhound or a great addition to a Greyhound family. Everyone who meets him agrees that he’s an exceptionally sweet fella. There’s nothing terrible about this two-year-old! Amy is utterly adorable, totally calm and keen for attention. She’ll be a great companion for anyone who enjoys exercise, and she’s completely fine around cats. Right now, Amy’s living in a foster home in Dayton, but she’s more than ready to find a family looking for a forever four-legged friend. 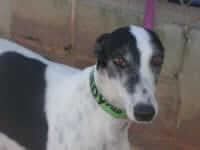 Well-tempered and obedient, Foxy Lady is a very sweet, three-year-old Greyhound. She gets gold stars for playing well with others, including children, cats and small dogs. Slender and sparky, Foxy Lady loves long walks and weighs in at only 58 pounds. The agency is actively searching for a family willing to open their hearts to this courageous, happy canine. An enthusiastic eight-year-old, Ripley easily befriends everyone he meets. He enjoys learning new skills, and is a true “attention hound”. Ripley had been placed in a foster home in West Chester, after his first adoptive family had to give him up. But today, we’re extremely pleased to report, as of just a few days ago, Ripley has been placed in his forever home with a new family. Congratulations, Ripley! And these are just four of the lovely dogs who have benefitted from or are currently enjoying the quality care offered by the Greyhound Adoption of Greater Cincinnati. If you are interested in supporting the GAGC or if you live in the Kentucky, Indiana and Ohio tri-state area and wish to learn more about adopting one of these beautiful spirits, you can contact them at 513-624-7040. Because a portion of every dollar spent on Life's Abundance products funds the good work of our foundation, tens of thousands of dollars have already been contributed to dozens of animal rescues. In fact, so far this year, The Dr. Jane’s HealthyPetNet Foundation has already awarded funds to thirteen small rescues. For all of you who have purchased Life's Abundance products or made contributions directly to The Dr. Jane’s HealthyPetNet Foundation, you’ve aided our efforts to improve the lives of these Greyhounds, and many companion animals cared for by other agencies. If you wish to support other worthwhile rescues, many of which operate on shoestring budgets, by contributing to our foundation, you may do so online when checking out or you may send a check payable to the Dr. Jane’s HealthyPetNet Foundation, Inc. at P.O. Box 1425, Palm City, Florida 34991. It's such a sad story, but recently a greyhound track in Kenosha, WI is shutting down on Dec 31, where 500 dogs will be put down if they can't find a home. Thank you for doing what you can to help out these lovely animals. 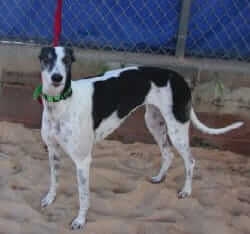 I would love to adopt a greyhound. Where can I get more info on these dogs in WI? 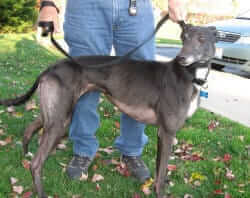 Go to www.grey2kusa.org for more info on the Wisconsin greys and all the other greys in need of homes. There's also a track closing in Phoenix, which will be the priority for west coast adoption groups. As the racing industry dies, this will happen more and more. We have two senior greys-no better dog on earth. 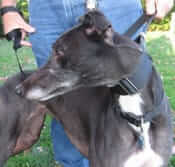 In California, go to www.greyhoundfriendsforlife.org. These dogs are so loving, a friend rescued two of these several years ago. They are now gone, but the joy of owning them still remains in his heart. 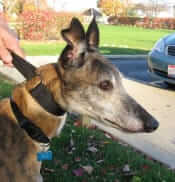 We have very active Greyhound Rescue organizations in our area. 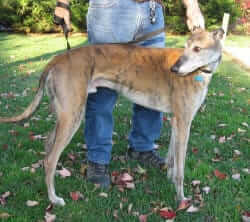 There are so many Greyhounds to be adopted now that the owner requirements are not as stringent when it comes to having a fenced yard.